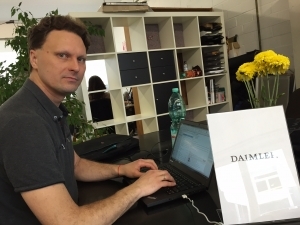 Veaceslav Driglov is an experienced Business Innovation Manager at Daimler AG and an expert in building up startups. Through his career at major companies and startup accelerators, he gained proficient knowledge in how to bring corporates and startups together and help them grow side-by-side. Mr. Driglov, thanks for having you! What is your first thought when you think about Corporate Entrepreneurship? I think it’s the future of digital transformation and it is an effective and efficient part of it. It has to be studied, understood, processed and then implemented. What in your opinion is the biggest challenge regarding Business Innovation in global companies? I think it’s the culture we face. Coming from a corporate company, we have a very strong and a very well defined structure. When you’re trying to be innovative, when you are trying to be disruptive it means that you are changing or sometimes ruining some of their basic, fundamental tiers of this structure or the culture. Sometimes it is well accepted, but sometimes people might not be very happy that you are changing the whole setup. As you are an experienced entrepreneur – if you had to give one single advice on corporate entrepreneurship, what would it be? Don’t be afraid, take risk, but be mindful at the same time. What was your best experience at the Corporate Startup Summit so far? Oh, I learned a new word yesterday. We are starting a new corporate accelerator program and we were trying to identify what type of program it is. We thought it was just a regular accelerator. Yesterday I learned a new word: It’s a Skunk Works Accelerator. I’m pretty excited about that. Everyday you learn something new.